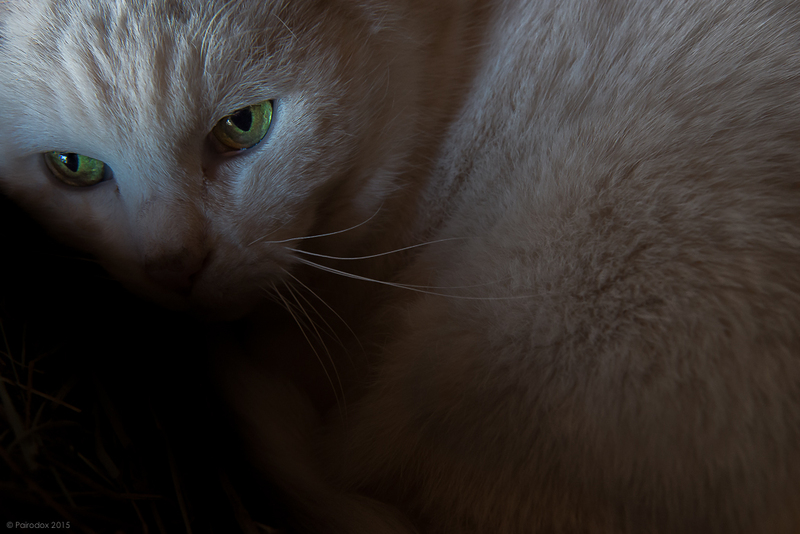 Barn cats will have their stories and Merlin has more than his share. He, like so many other Jellicles, found us one day and, rather than continue on his way, decided to stay. We have been glad of it. I’m not sure how many of his proverbial nine lives remain. Surely eight, perhaps fewer. Merlin is a very lucky cat and, if you were to ask him, I think he would agree. He has always gotten along well enough with the other barn cats and has paid scrupulous attention to the established hierarchy. Not too high on the pecking order, Merlin has always been quiet, respectful, and deferential. One afternoon, several years ago now, we noticed a number of cats moving quickly toward the woods. When Joanna arrived at the source of the confusion she found what she describes as a whirl of brown and white which eventually resolved into Merlin trying to extricate himself from the jaws of a Bobcat. When faced with the situation [parallels to which seem to happen often around here, and most recently involved a Grey Fox and one of the hens] Joanna rushed at the melee and shouted, with authority, DROP IT! And the Bobcat obligingly did, and fled. Merlin, still alive, immediately ran for cover. With some effort we extricated him to find the anticipated lacerations and called our veterinarian for advice which was, Bring him in. Upon closer examination it was discovered that the attacker’s teeth had established a good grip on Merlin’s skull and lower jaw. Swift kicks opened Merlin’s underside from stem-to-stern; he was in tough shape. Our very good friend (and large animal veterinarian) Bob knows his stuff and rises to the occasion on especially challenging cases. Two days, as many drains, and dozens of stitches later Merlin was home for an extended recuperation. When he was well he took up residence once more in the horse barn. He likes it there. He’s quite jumpy now and starts at most movement and at unfamiliar noises. I’m afraid he suffers from the feline equivalent of PTSD. Wouldn’t you? Spring has arrived at the farm and all but the very last bits of snow and ice have disappeared. The winter seemed especially long and very cold. We fed round bales of hay to Ari (the horse with whom Merlin shares his digs) this winter and Merlin took quick advantage of the abundance of loose forage. 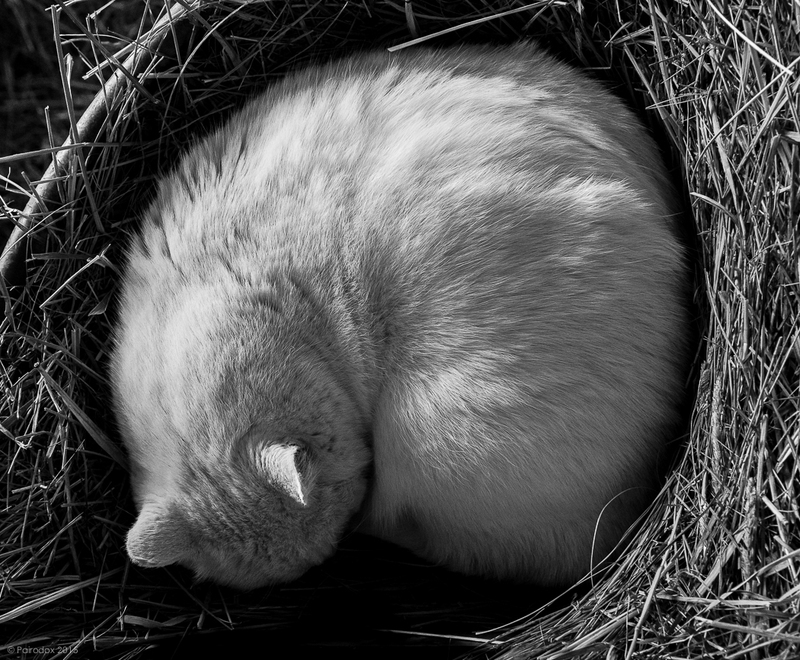 I have never seen a cat build a nest in this way before but build one Merlin did, and it looked to keep him very warm and comfortable. On the coldest of nights he would even pull a blanket of hay across the top of his little niche. Clever, jellicle, fellow is he.